Facebook has been getting a bad rep lately for a lot of different things — and rightfully so. There’s the looming fake news problem it can’t seem to fix, and it’s been held accountable for the surprising result of this year’s US election. The first one is for the company to fix, but the second is something that’s a inherent problem of every social network. If you’ve been on Facebook for a while, you’ve been slowly and unknowingly building up a profile of content Facebook thinks you want to see. Whenever you like a post, page or another form of content, the service learns and records your preferences to generate an algorithmically curated news feed catered to your interests. But that also means you won’t see anything you might not agree with, or don’t like. When Trump got elected, Democrats around the US didn’t see anyone celebrating on social media, even though almost half the country voted for him — simply because it all got filtered out. 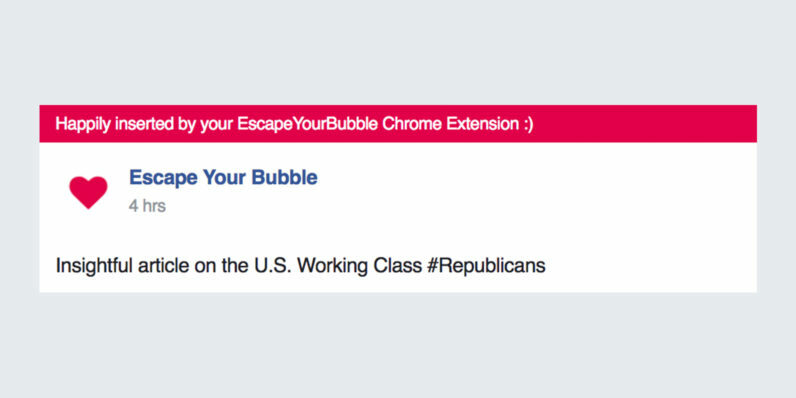 EscapeYourBubble is a Chrome extension that wants to try and help everyone understand each other a bit more. Once installed, it asks who you want to understand better — Democrats or Republicans. Based on that choice, it then adds contrasting posts to your news feed. The content is curated from high quality news sources, and consists of articles meant to give an insight into the positive qualities of the group you wish to understand better. Shortly after installing, I came across an article featuring a pink banner saying it had been put there by the extension. I told it I wanted to understand Republicans, so it linked to a New Yorker piece about the lives of poor people in small town Ohio. The article would offer a Democrat a new perspective on why anyone would vote for Trump, an idea that might seem completely alien to someone who voted for Clinton. Right now, the extension is aimed at US Republicans and Democrats, but the rest of the world could also use it — just take a look at the Brexit referendum results that shocked millions across the UK. It’s possible to stop ourselves from polarizing even further, and increased understanding of others’ viewpoints would make for a better world — we just have to try a little harder.